Fishing for muskellunge, or muskie, as they are called in most places, is a challenging experience. The fish of a thousand cast as they are called, Muskies are among the most elusive and fastest-swimming freshwater fish in the Southeast United States. Whether you're luring them with a top water lure or baiting them with live bait in lower depths, catching a muskie can be tough. But if you have the right equipment and some patience, you can catch a muskie or two. In this blog I wanted to share a great story about an amazing fish and the angler who chose the life of a fish over getting his name in the record books as a record breaking musky angler. Scott Berrier from Clinton Tennessee, was fishing from the banks of Melton Hill Lake located in East Tennessee on January 20th, 2011. It was getting late in the day and Scott sait to his friend Bill Horn, ?Ten more cast and I?m out of here, ? Little to Scotts suprise the fish he caught on his third cast would measured 53 and 3/8 inches long and have a 26 inch girth. A monster musky for certain. An artificial lure got the mammoths attention enough to turn it around and follow, ?The fish swirled once and followed my lure, it looked like a gador following the lure?, Scott said as he told the story to me. After stalking the lure the monster musky decided to eat. The size of the fish shortened and lessened the fight of less than six minutes, but Scott will never forget the adrenaline. Scott knew he had a record musky, but he also knew that his trophy would die if he didn?t get it back in the water quickly. Scott then made a tough decision and the fish was released. This fish demonstrates the potential of the Melton Hill musky fishery but it more demonstrates what true sportsman and preservationist we have fishing our lakes and rivers in Tennessee. The sad tragidy of this story is economics. This great state, despite the hard work of the Tennessee Wildlife Resources Agency stocking fish and enforcing regulations their ?resources? are somewhat limited. Scott knew that in order for him to claim a new state record the fish would have to die before an enforcement officer could make it to certify his catch. Scott told me that he was taught his angling skill from his father, he wants his children to grow up with the same opportunities to catch fish like this as well. This fish will set the standard of what's to come if the state continues the work they are doing at Melton Hill and other bodies of water throughout the state. Stocking is only part of the wonderful job they do. 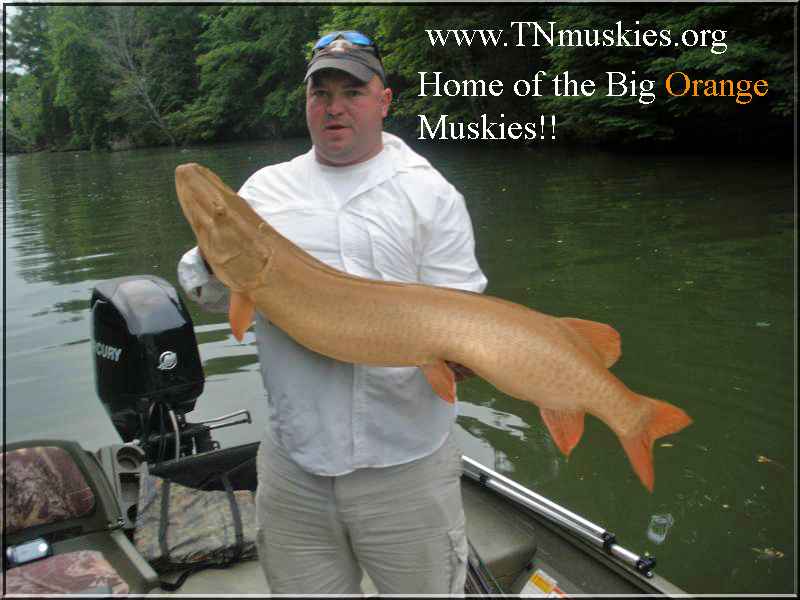 The muskies will continue to grow as anglers in the area become educated and are properly equipped to handle muskies. 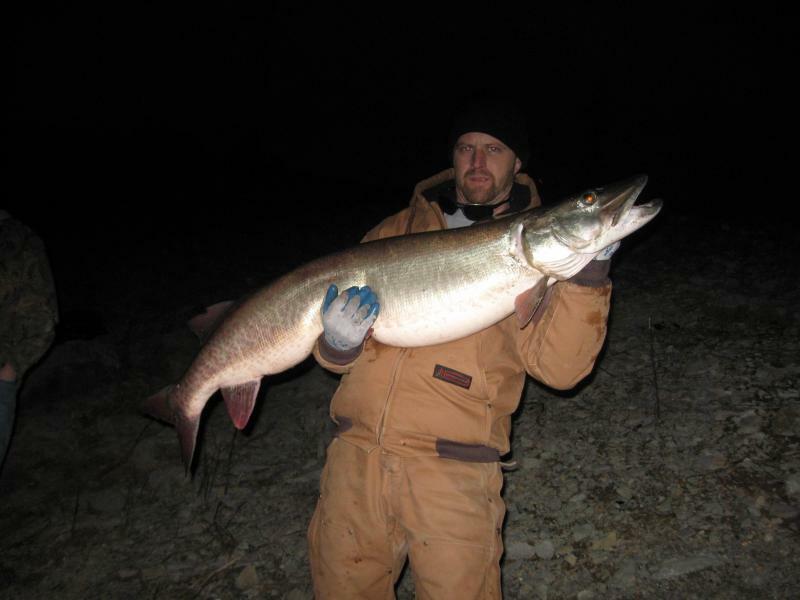 However, many fish have died before reaching their maximum size and it will take more sportsmen like Scott that are willing to release trophy muskies before the potential sizes of these magnificent fish is known. The minimum harvest length for Melton Hill is 50?, but few will reach this length without management. It is unfortunate that a record trophy fish must die before it can be certified as a record in this state due to staffing and equipment limitations due to finance. I only hope this blog can bring awareness to this truth and somehow help the state and anglers take full advantage of catch and release. The fish measuring 53 3/8 ? = 53.375? would weigh approximately 43.5 lbs by standard conversion for Muskelung using the formula (Length³ ÷ 3,500 (length x length x length ÷ 3,500), 42 LB 8 oz is the current state record set by Kyle Edwards in April of 1983 at Norris Reservoir located near Anderson County Tennessee. Scott as a fellow angler, I do understand and commend your decision to release the wonderful fish, and on behalf of anglers everywhere and for generations to come I thank you. In my eyes you did break the record. It is an honor to live and fish in this wonderful state, Bass, Trout, Walleye and trophy musky fishing here in Tennessee is amazing, but there is a downside. According to expert musky and striper guide, Billy Davis, who first reported this story on his website, ?On Melton Hill Lake, the TWRA puts much of effort into the musky fishery so that anglers have the opportunity to chase these trophies. While some may see the fishery as flourishing with the amount of fish that are being caught around Bull Run Steamplant, others have realized that the fishery has been abused by the use of live bait techniques and by the mishandling of caught fish. Even striper guides are now targeting muskies and taking them out of the system. 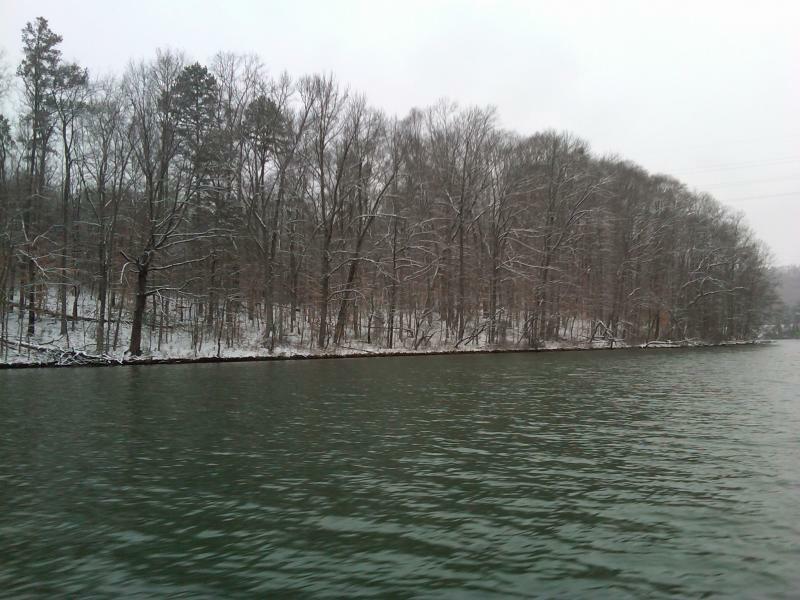 The newly established 50" limit on Melton Hill will ensure that some fish are returned to the water, but some of the methods used by many to catch and handling of these fish will lead to unintentional mortality. Pictured here is a 38" musky that was probably guthooked or mishandled by someone unprepared to release the fish. If you do plan on chasing muskies, please make sure you are prepared with the proper equipment. 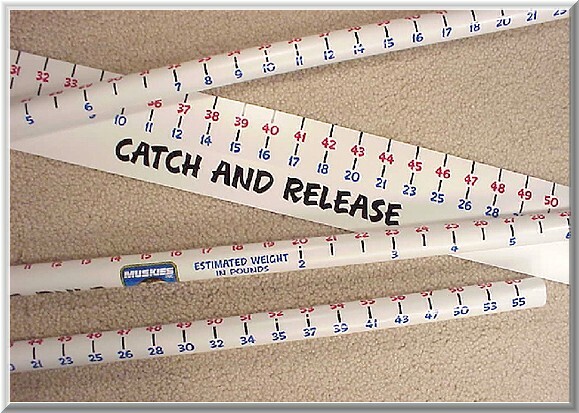 Heavy line, a large knotless net, hook cutting and release tools are all necessary to ensure that the fish you have caught has a chance to go back and grow. If the general public is not educated about the rarity of this musky fishery and regulations are not put in place to ensure that congregated muskies are protected, the entire musky fishery can be devastated. This is one resource that needs to be protected so everybody will have a chance to catch and release true trophy muskies in the future. Pictured here is a 48.5 inch fish that will never make it to 50"
I hope the work of the state and dedication of the anglers continue in the future. I for one have gained a new respect for each as well as these magnificent fish.